The big story during August and September was Hurricane Harvey. At its worst, Harvey knocked about 20% of U.S. refining capacity knocked offline. As a result the average price of regular gasoline jumped by 34-cents per gallon (15%) between the end of July to the week of September 11th, when it peaked at $2.61 per gallon. The price of diesel increased also rose by 27-cents per gallon (10.7%). Crude oil prices actually fell as the storm hit Houston. During August the WTI price dropped from $50.21 per bbl to $45.96 per bbl. But since the beginning of September the WTI price has recovered, hitting $49.88 on the 18th. Going along with the crude oil price fluctuations, the U.S. crude oil inventory dropped by 19.8 million barrels (1.7%) during August, but risen since the beginning of September by 11.6 million barrels. During August the price of Brent crude rose slightly from $51.99 to $52.69 per bbl. Data on domestic oil production and imports are only available through June. That month domestic producers accounted for 53.2% of the U.S. oil supply, and domestic production averaged 9.1 bbl per day. Shale oil accounted for 52.5% of domestic production. Turning to domestic motor fuel consumption, for which the most current data is from last April, gasoline consumption totaled 12.0 billion gallons, up 206.5 million gallons (1.7%) from the prior April. This is a notable increase—over the most recent three months gasoline consumption had declined by 0.2%. Diesel fuel consumption in April totaled 3.4 billion gallons, up 153.2 million gallons (4.7%) from April 2016. During the prior 3-, 6- and 12-month diesel fuel consumption grew by 3.7%, 4.3% and 3.6%, compared to the same periods in the prior year. Regionally, over the three months from February—April the strongest growth occurred in New England states (18.3%) followed by the Southwest states (9.7%). States in the Southeast, Great Lakes and Far West regions also experienced some growth, but below 5.0% in all cases. The greatest decline occurred in the Mideast states (-3.9%). 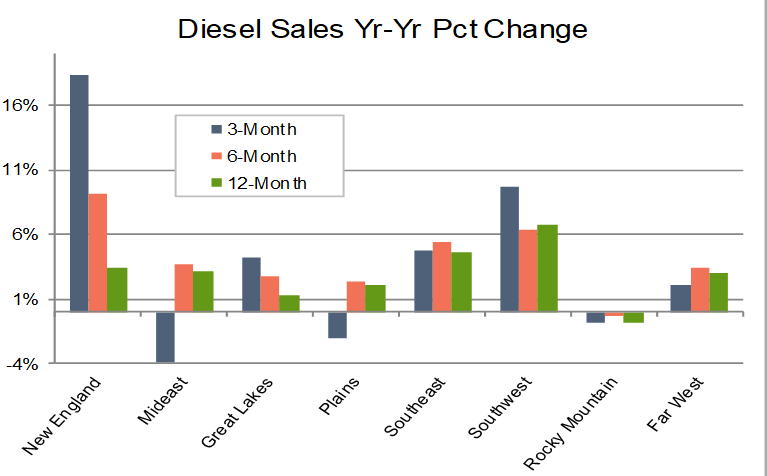 Other regions where diesel fuel consumption decreased included the Plains (-2.0%) and the Rocky Mountains (-0.8%). The states of the Rocky Mountain region have experienced year-over-year declines during the most recent 3-, 6- and 12-month periods. As shown on the above graph, the relationship between the 3-month moving average of diesel fuel sales and manufacturing employment continues to hold. 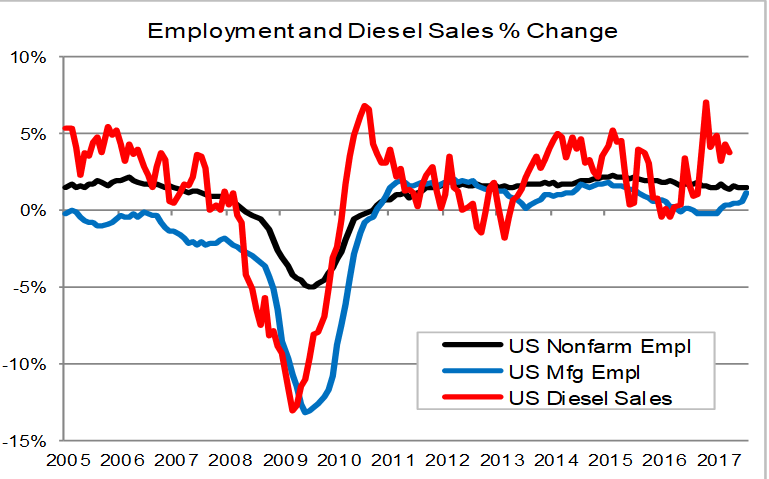 However, the number of months by which changes in the diesel series leads the manufacturing employment series does fluctuate. The diesel series started becoming increasingly positive in March 2016, while the growth rate for manufacturing employment stayed negative until February 2017. Manufacturing employment growth has stayed positive and has continued to increase over the past seven months with a large jump from July (0.6%) to August (1.1%). If the relationship continues to hold, the year-over-year manufacturing employment growth rate will likely level off at about 1.3% for the remainder of 2017.